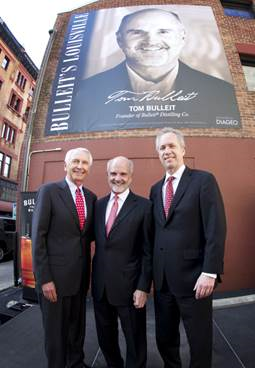 History was made today as the bourbon pioneer, Tom Bulleit, was recognized by Ky. Governor, Steve Beshear and Louisville Mayor, Greg Fischer for excellence in his respective field of entrepreneurship. For the past 12 years, The Greater Louisville Pride Foundation has strived for the campaign to enhance community pride and serve as inspiration for Louisville residents. 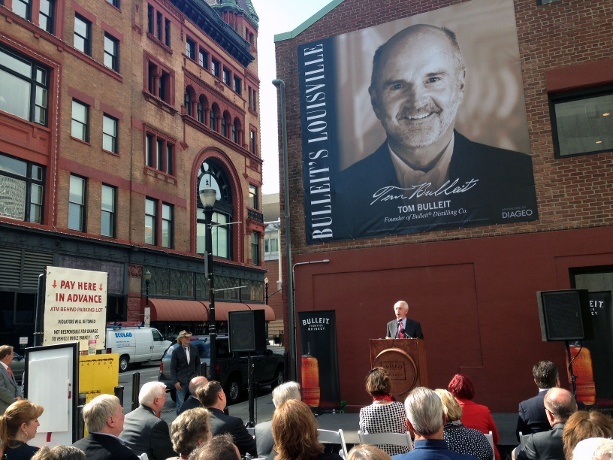 Today, a giant mural was unveiled in honor of the 22nd Louisville Hometown Hero, Tom Bulleit. A proud and hardworking Kentuckian, Tom’s southern charm can be noticed by all through the mural currently displayed in downtown Louisville at 138 South 3rd Street, between West Market and West Main Street. In 1987, Tom quit his job as a successful Louisville lawyer to start the Bulleit Distilling Company– forever forging his family name into the annals of bourbon history. Today, Bulleit Bourbon, Bulleit Rye and Bulleit 10-Year are some of the fastest growing small batch whiskies in America and have been launched in countries around the world. Fiercely passionate Kentuckians, Tom and his wife Betsy are proud to call the Bluegrass State home. Sharing his passion for bourbon, he travels the country introducing his family’s Kentucky recipe to thousands of people each year. In addition to an unwavering dedication to reviving a 150-year-old family bourbon recipe, Tom has been a mainstay in the Louisville community throughout his life. After graduating from Trinity High School and earning his B.A. from the University of Kentucky in 1966, Tom served his country during the Vietnam War as a member of the U.S. Marine Corps from 1967-1969. Upon returning home, he earned a law degree from the University of Louisville School of Law, all while working in Kentucky distilleries between terms. Stemming from his commitment to share his family’s legacy, Tom was appointed by Kentucky Governor Ernie Fletcher as a member of the Honorable Order of Kentucky Colonels in 2006, the highest accolade a Kentucky citizen can receive. In 2009, Tom was inducted into the Kentucky Bourbon Hall of Fame – the most prestigious honor available for those in the industry. Print article This entry was posted by Art Eddy III on April 29, 2014 at 12:38 pm, and is filed under Lifestyle, News. Follow any responses to this post through RSS 2.0. Both comments and pings are currently closed.